When a musician is required to double on a different instrument for a section of a piece, the instruction to switch instruments is generally placed above the staff at the beginning of that section. A return to the primary instrument is handled in the same manner. 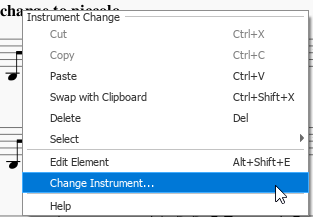 MuseScore enables users to insert a special class of text called Change Instrument text for this purpose. This class of text is different from either Staff or System text in that it links the text to the playback and changes the sound to the new instrument. The sound played will be changed to that of the new instrument from that point onward, but the mixer display remains unchanged. 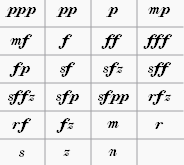 Subsequent notes are automatically adjusted to indicate the correct written pitch for the new instrument (but the new key signature still needs to be added manually—see below). The new instrument name will be displayed in front of the following systems. Insert a new key signature, if required, at the change, for the staff in question. Note: Mid-staff instrument changes are limited to the same type of staff. For example, you cannot change between a percussion staff and a pitched instrument staff or vice versa. The Mixer allows you to change instrument sounds, adjust volume and panning, and make other adjustments to the playback for each staff. From the main menu, select View→Mixer. The Mixer is split into a Details Area on the top and a Track Area below. The track area is at the bottom and displays the Master Gain as well as a row of tracks. The Master Gain controls the overall output volume. To adjust it, click and drag the slider handle or enter a value in the box underneath. The Track Area displays allows you to adjust the volume of the instruments used by your staves. 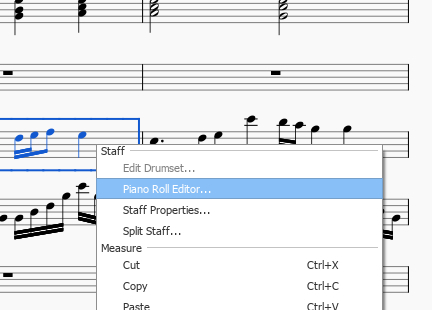 MuseScore creates one "part track" for each staff in your score. These part tracks can be further subdivided into "channel tracks" corresponding to the different sounds used within the staff. While many staves only need a single channel track, others require multiple channels so that the instrument can play more than one sound (e.g. a violin which can play in arco, tremolo or pizzicato voices); or because of a Mid-staff instrument change. These extra channel tracks can be shown or hidden by clicking the arrow button on top of the track control. Expanded part track, showing the child tracks in pink. Every part track has a button on the top with an arrow on it. When clicked, this will toggle whether the channel tracks of the staff are displayed next to it. Channel tracks do not have an arrow button. Instead, the name of the track they are a part of is displayed. At the top of each track is a green solo button and a red mute button: each can be toggled on or off. If any Solo button is checked then only tracks that have Solo lit will play. If no solo is lit, all parts can potentially play. Mute does the opposite: any track that has mute lit will not play. By using a combbination of mute and solo buttons, you can control which instruments are heard during playback. The dial below the mute button controls panning left and right. You can click and drag on the dial to change the pan value. Note: MuseScore does not yet support pan values for the part track, so the part track displays the pan value of the first channel instead. Setting the pan value of the part track will automatically set all of its children to the same value as well. The slider in the middle of the track controls the playback volume. Note: MuseScore does not yet support volume values for the part track, so the part track displays the volume value of the first channel instead. Setting the volume value of the part track will automatically set all of its children to the same value as well. The text box at the bottom of the track contains the current name of the tracks part or channel. The details area displays and provides finer control of the currently selected track. The name of the part this track is associated with. Both part tracks and channel tracks display the part name. Note: The part name is editable, but this only have effect for the Mixer.The cannel name is no editable. This is a color the user can choose to help distinguish a particular part. Double clicking on this swatch will allow you to choose a different color for displaying the name of this track. 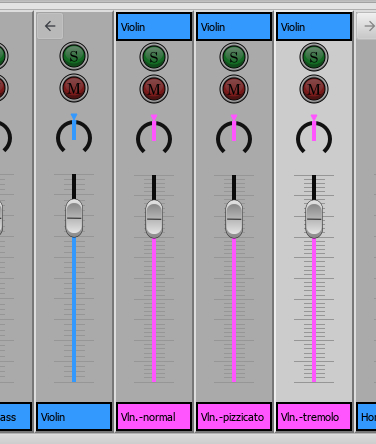 Setting the color of a part track will automatically change the colors of all its child tracks. If a channel track is selected, the channel name is displayed here. Indicates if this part represents a melodic instrument or a drumkit. For regular melodic instruments, each pitch in the same patch usually has the same timbre, while drumkit patches usually have different timbres for each pitch. This is the actual Sound from the soundfont, that is used to render your instrument. The overall loudness with which the sound is played. The panning applied to the part. The output MIDI port and channel the part is played on. This allows you to mute individual voices within each staff. Each row represents a different staff within a part. So pressing '2' on the top row will mute the second voice on the first staff of the part. At the bottom of the details area is a wide button with a tiny triangle on it. Clicking this button will hide the details area to give you more room. Clicking on it again will restore the details area. The "Sound" drop-down menu lists every instrument supported by your current SoundFont. If you have multiple SoundFonts loaded in the Synthesizer, all the patches from all the SoundFonts (and/or SFZ files) will appear in a single long list—in the order previously set in the Synthesizer. 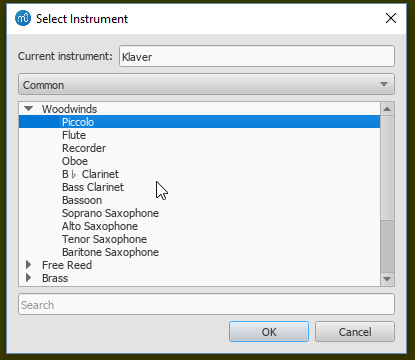 Tip: To find an instrument, click on the "Sound" list and type the first letter of the instrument name. Repeat as required. Some instruments come with multiple channels in the Mixer that can be used to change sounds midway through a score. For example, a staff for a stringed instrument (violin, viola, cello etc.) is allocated three channels: one for "arco" (or "normal"), another for "pizzicato" and another for "tremolo." A trumpet staff will have one channel for "normal" and another reserved for "mute," and so on. 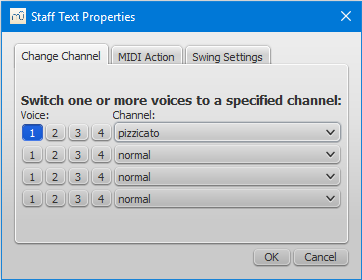 The following instructions use pizzicato strings as an example, but the same principle can be applied to any other instrument staff that allows sound changes. Every note after the staff text you added now sounds pizzicato. To return to a normal strings sound later in the piece, follow the same guidelines as above except type "arco" in step 3 and select normal in step 6. To display the Synthesizer: from the menu, select View→Synthesizer. Load and organize different sound sample libraries to play back the music. Apply effects such as reverb and compression. Fluid: A software synthesizer that plays SF2/SF3 SoundFont sample libraries. Zerberus: A software synthesizer that plays SFZ format sample libraries. Master Effects: Used to apply multi-effects to the score. Tuning: Used to adjust overall playback tuning. Set as Default Saves all current synthesizer settings as the default settings. These are automatically applied to the Synthesizer when you open MuseScore. Load Default Loads the last saved default settings to the Synthesizer. Save to Score Saves all current synthesizer settings to the current score only. Load from Score Loads the settings from the current score to the synthesizer. Notes: (1) "Synthesizer settings" include the order of Soundfonts and SFX files, effects set-up, master tuning and volume. (2) Only one set of Synthesizer settings can be in effect at a time—i.e. if multiple scores are open at once, it is not possible to make changes to the Synthesizer in one score and leave other scores' settings untouched. (3) Changes to synthesizer settings will not be heard in exported audio files unless saved to the score first (see table, above). See also Tuning (below). 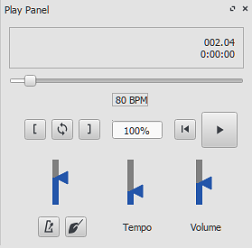 Click on the Fluid tab to access the control panel for SF2/SF3 SoundFont sample libraries. By default, the SoundFont FluidR3Mono_GM.sf3 should already be loaded. You can load, rearrange and delete soundfonts as required. Playback can be shared between any combination of different soundfonts (and/or SFZ files). The order of soundfonts in Fluid is reflected in the default order of instruments in the mixer. Click on a soundfont in the list. To be able to load the soundfont, it first needs to be installed in your Soundfonts folder. This will ensure that it appears in the list in step 2 (above). Use the up/down arrows (on the right-hand side) to adjust the order. Repeat with other soundfonts in the list if required. The order of virtual instrument sets in the Synthesizer is reflected in the order of instruments listed in the Mixer. So, if playback of a score depends on a mix of instrument sets, it is advisable to save the Synthesizer configuration to the score in question by pressing the Save to Score button. 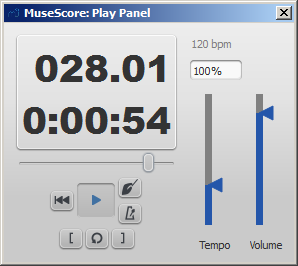 When you next wish to play back the score, press the Load from Score to load the same configuration. However, remember this only sets the order of instruments—not the instruments themselves, which should be in place on your computer. This removes the soundfont from the synthesizer but does not uninstall it from the Soundfonts folder: it will still be available if you wish to reload it later. Click on the Zerberus tab to access the control panel for SFZ sound sample libraries. You can add, delete or reorder files in a similar way to the Fluid tab. Note that, as with Fluid, the the SFZ files must first be installed in your soundfonts folder before they can be loaded into the synthesizer. The slider on the right of the Synthesizer controls the playback volume: any changes made here last only to the end of the sesssion, unless saved to the score or set as the new default. The Master Effects tab of the Synthesizer allows you to add reverb and compression to your score. Select an option from the drop-down list next to Effect A or Effect B (the effects are applied in series, A → B). To store and load effects configurations, use the buttons at the bottom of the Synthesizer window. See Synthesizer settings (above) for details. Delay: Set a pre-delay for the reverb from 20-100 ms.
Low RT60 (Low frequency reverb time): Use the grey control to adjust the center frequency (50–1000 Hz) of the low frequency band which you want to affect: the green control adjusts the reverb time (1–8 secs) of this frequency band. Mid RT60 (Mid-range reverb time): Adjust the reverb time (1–8 secs) of the mid-range frequency band. HF Damping: Adjusts the high frequency component of the reverb. Increasing this value increases the frequency of the cut-off point and makes the reverb appear brighter and longer. EQ1: Allows you to cut or boost (-15 to +15) a frequency band (center = 40 Hz - 2 KHz) in the lower part of the spectrum. EQ2: Allows you to cut or boost (-15 to +15) a frequency band (center = 160 Hz - 10 KHz) in the higher part of the spectrum. Output: Controls the amount of effect applied. "Dry" is no effect. "Wet" indicates 100% reverb. "Mix" is a 50/50 balance of wet/dry signal. Note: EQ1 and EQ2 affect the tone of the reverb only, not the dry (unprocessed) signal. To quickly set up an effects patch, set "Output" to "Mix" and adjust the "Mid RT60" control to the desired reverb time. Then fine tune the effect as explained above. RMS: Adjusts the balance between RMS (0) and Peak (1) compression. In the former, the compressor responds to averaged-out levels in the signal; in Peak mode, the compressor responds to peak levels. Attack: (1.5–400 ms) The length of time it takes for compression to engage fully after the signal exceeds the threshold level. Release: (2–800 ms) The time it takes for compression to return to zero after the signal falls below the threshold level. Threshold: (in dB) The signal level above which compression starts to take effect. Lowering the threshold increases the amount of signal that is compressed. Ratio: The amount of compression applied to the signal above the threshold. The higher the ratio, the greater the compression. Varies between 1:1 to 20:1. Knee: Allows you to select a range between "soft knee" and "hard knee". The softer the knee, the more gradual the transition between uncompressed and compressed signal. Gain: Compression tends to lower the volume, so use this control to boost the signal as required. To quickly set-up, try setting RMS = 1, Threshold = -20 db, Ratio = 6. Increase Gain to restore the lost volume. Then fine-tune as explained above. The Tuning tab is where you can adjust the program's master tuning. For Concert Pitch instruments, A4 = 440 Hz by default. Enter a new value in the Master tuning field, then press Change Tuning. Notes: (1) This tuning applies to all scores in the current session only. To make this the program default or to store it to a particular score, see Save/Load Synthesizer settings. (2) To apply the new tuning to exported audio files (WAV, MP3, OGG), press Save to Score before exporting. Dynamics are symbols indicating the loudness of a note or phrase of music. They can be found in the Dynamics palette in either the Basic or Advanced workspace. Additional dynamics are available in the Master Palette (Shift+F9). Note: if you wish to adjust the overall playback volume of the score, use the volume slider in the Play Panel, or Synthesizer. Select a note and double-click a dynamic symbol in a palette. Drag a dynamic symbol from a palette onto a note. To create a crescendo or decrescendo, see Hairpin. The default loudness of the score is mf (mezzoforte)—set at MIDI velocity 80 (out of 127). Depending on the dynamic governing a particular section of the score, velocity (and hence loudness) may be less than or greater than this. Select the dynamic and, in the Dynamic section of the Inspector edit the Velocity value—higher for louder, lower for softer. Select the dynamic, and in the Dynamic section of the Inspector, chose an option from "Dynamic range". The default is "Part," which means that all staves for a particular instrument will be affected. "Staff" limits the effect to the staff attached to the dynamic. "System" means that all staves in the system will be affected by the dynamic. Any dynamic can be edited after being added to the score, just like standard text. You can also edit the velocity and dynamic range etc. (see above). If desired, you can save the result for future use in a custom palette.